I thought I would just update you on the Scott deal at ShopRite. The other day I posted that there is a new $1.50/1 Scott Tube Free Coupon that can be stacked with the $2/1 ShopRite Coupon found in the ShopRite LiveRight Book . Plus there is a catalina Scott Catalina Deal going on. A lot of you are having issues using the manufacturer coupon with the $2 ShopRite coupon. 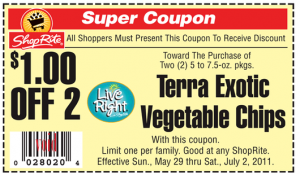 I want to point out to you the difference in the coupons so that you will be able to better explain to customer service that the coupon in the LiveRight book is, in fact, a ShopRite coupon and can be stacked with a manufacturer coupon. You can see that the UPC code has the same amount of numbers as the ShopRite coupon above. It also starts with a “0” and it has no remit address on it. So, although it looks a little different then the typical ShopRite coupons, it is still a ShopRite coupon. This manufacturer coupon has 12 numbers in the UPC barcode and the first number begins with a “5”. 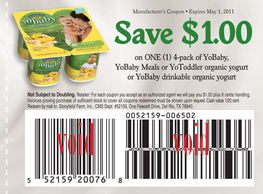 All manufacturer coupons begin with either a 5 or a 9. Plus, although it may be hard to see in this picture, there is a remit address making this a manufacturer coupon. Now that we have gone over the coupons, the other issue is that the catalina does not seem to be printing when the Scott Tube Free Bath Tissue is included in the transaction. Possibly it wasn’t put into the system. If you have already made a purchase and did not get the catalina, then you can email catalina marketing or call them. They have very good customer service. There contact info is: 1-888-826-8766 or via email ncsc@catalinamarketing.com. Once we clarify, we’ll send out a communication to the stores. In the meantime, please ask your readers to call 1-800-ShopRite if they have a problem redeeming it in their local store. We’ll be happy to send a $2.00 ShopRite coupon to replace its value.